Viking TR100 Pro Tripod with KH-1 Head has been tailored to meet the demands of advanced birdwatchers and photographers, only the highest quality materials are used throughout. 8x 100% Carbon fibre legs provide unsurpassed strength verses weight. The twist lock legs maintain the sleek design but still allow secure and speedy adjustment when required. 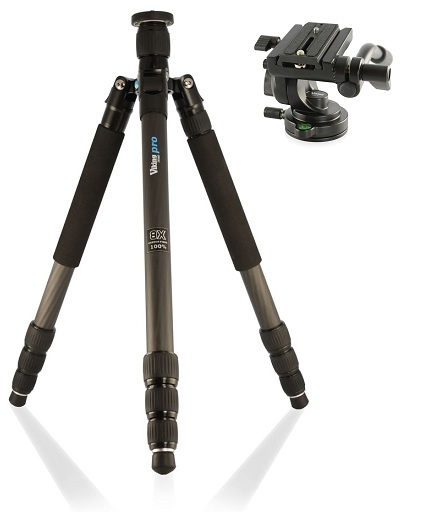 The TR100 Pro also features a removable monopod. The rubber foot cover can be removed uncovering a spiked end that provides stability no matter what the conditions. The 4 section legs of the TR100 Pro are constructed from 8x 10h not only minimises weight but also reduces vibration. A combination of rubber feet and spike on each foot means total stability no matter what the terrain.